In the picture above show the Queen chess piece. It has made of Teak wood that have chosen to get the best quality of chess piece product. 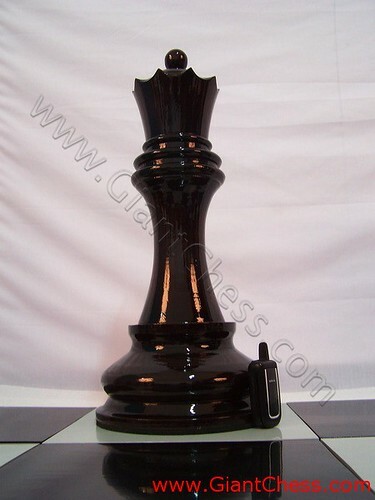 The Queen chess piece is polished well in black and looks glossy. It has carved by our professional craftsman from Java island that famous about its wooden furniture. This kind of chess piece very popular for kids and adolescent who like to play chess outdoor. Beside as outdoor chess game, you can also use it for outdoor and indoor decoration. Excellent to put it in your living room, bedroom, children room, and the other. Perfect for decorate your green garden or backyard, decoration part for outdoor party, balcony, and another occasions. It made of Teak wood and very durable for outdoor use, because our main material through in selection way to get the best Teak wood and also has dried. So you do not need worry to put it at your garden. Get the best price from us. Buy now and dressing your house with this unique and unusual wooden house decoration.